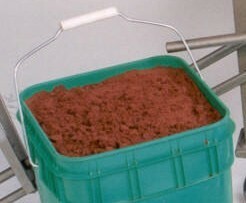 Oil Bonded Sand pre-mixed in 35 lb buckets. Stock item. Please note- please call (217-446-0941) or email us (sales@mifco.com) for shipping charges if you do not provide us with a UPS account number. Phone your order in and provide credit card information. Orders for more than 4 buckets of oil bonded sand may need to ship via truck.